The hardest part about traveling? Having your plans fall through. The best part about traveling? When your last minute back-up plan ends up being even better than the original. 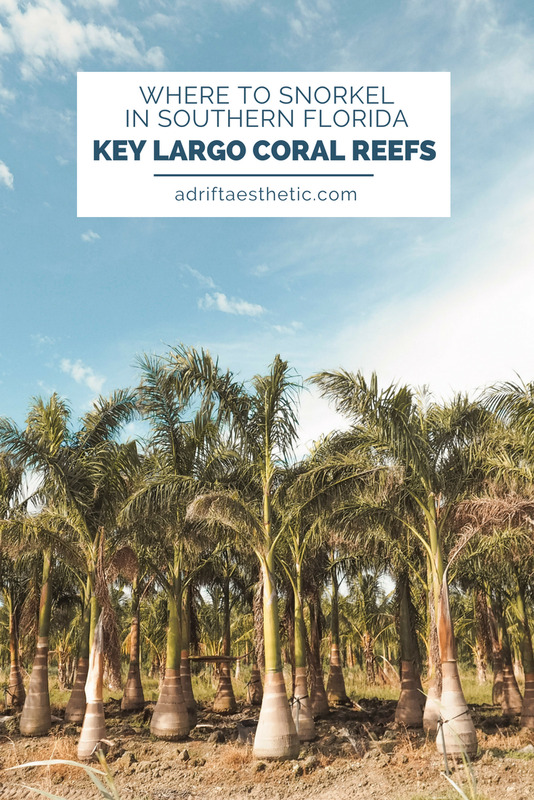 When our plans for snorkeling fell through in Florida, a day trip to Key Largo proved to be the marine adventure we were looking for. Traveling to Fort Lauderdale and Miami, Florida, there were a few things I knew I had to experience: Cuban sandwiches in Little Havana, relaxing on the beach, and snorkeling in the ocean. In terms of distance from where I was staying, Biscayne National Park was the best choice for the latter item on that list. This National Park is incredibly under-rated because there aren't vast hiking trails to wander or campsites to hunker down in underneath the stars. Instead, the majority of Biscayne is underwater and part of a marine sanctuary; snorkeling and scuba diving are the only ways to really see it. My friend Sarah (a marine biologist living in Fort. Lauderdale) and I drove two hours outside of the city, eventually making our way through desolate swamp-land and acres and acres of palm tree nurseries to arrive at the Biscayne National Park entrance. My swimsuit was on, Sarah had her snorkel gear ready and we were pumped to see a new world underwater. But when we walked into the small visitor center we were distraught to learn from the Park ranger that all the snorkel trips for the day had been cancelled due to high winds...not what you want to hear when you're only in Florida for three days and can't reschedule. Fast forward 40 minutes later, exploring a bit of the park and snapping some pics, we sat in our car googling where to go next. A set of glowing yelp reviews led us to Sun Diver Snorkel Tours with the last snorkel tour of the day taking off at 3pm. It was 2:10pm. The snorkel company was a 45 minute drive. And so began our race against the clock to make it to Key Largo, the northern-most key of Key West, Florida. We drove into the parking lot with 5 minutes to spare and were treated to an afternoon of snorkeling 5 miles off the coast of Florida. My previous experience on ferries in the ocean have taught me that seasickness is my biggest enemy. I quickly grabbed a seat outside at the back of the boat ahead of the other 12 people on our tour. As we took off for our adventure, we passed gorgeous mansions and boats as we made our way out of the Key Largo docks and began our trip out to sea. About 40 minutes later we dropped anchor and were able to explore the reef near the boat. Upon first jumping into the water I almost landed on a Moon Jelly. Though not as harmful as a Box Jellyfish, our captain warned us that we could still get a pretty painful sting from those little guys. I carefully let it float past me before I pushed on towards the reef. It was my first time ever seeing a jellyfish outside of an aquarium! Snorkeling is a crazy experience, almost as if you're a drone hovering above a full city of fish and coral, watching their every move...some serious Big Brother vibes. I've never snorkeled in the open ocean before and fighting the waves and current was definitely a workout (and a true test of my seasickness limits). We saw Southern Stingrays and Barracuda swim beneath us and a whole slew of fish from Blue Tong to Rock Beauties. Finally my seasickness got the best of me and I had to return to the boat. The first mate taught me the best trick that I will forever remember: rubbing ice cubes behind your ears helps cure seasickness (even extreme cases) in a matter of minutes. I guess it's because you're numbing your inner ear which is the source of your body's balance but it really seemed like magic to me. I was able to return to shore after our trip back feeling great! Dinner after a full day of snorkeling in the open ocean became our top priority and a great place to stop on your drive out of Key Largo is Gilbert's Tiki Bar. Part of the larger Gilbert's Resort, this massive outdoor bar and restaurant features thatched roofs and a boat dock if you need to park your water transportation. Known for their conch fritters (which were definitely the best part of our meal) they also have a wide menu of other seafood options and boozy cocktails known as Boobies with portions of each sold going to the American Cancer Society. Although I plan to return to Biscayne National Park in the future with snorkel gear in hand, at least we were able to take advantage of our day thanks to the internet, Google and little luck with timing. Proof that even bad situations while traveling can turn out positive.